Welcome to the izzudrecoba.com website (the “Site”). These terms and conditions (“Terms and Conditions”) apply to the Site, Izzudrecoba Enterprise (2630949-A), which reference these Terms and Conditions. “izzudrecoba.com” means Izzudrecoba Enterprise, a company incorporated in Malaysia under registration number 2630949-A and having its registered in Malaysia. The streaming video account subscription are made affordable to you based from the shared account. Please proceed to purchase from our online store only if you are agree to subscribe to a shared account. *NOTE: Maxis Router is known to have issue with DNS/VPN setting for Roku. You are suggested to purchase different router (e.g. TP-Link or D-Link) in order to setup DNS/VPN on your router admin page, thus are able to unlock US streaming channels on your Roku. “izzudrecoba.com” means Izzudrecoba Enterprise, a company incorporated in Malaysia under registration number 2630949-A and having its registered address at Malaysia. a. The Buyer shall be entitled to make payment for the Goods pursuant to the various payment methods set out in izzudrecoba.com’s website. The terms and conditions applicable to each type of payment, as contained in izzudrecoba.com’s website, shall be applicable to the Contract. izzudrecoba.com accepts all Visa and MasterCard credit cards using SenangPay, and is 3D Secure (Verified by Visa, and MasterCard Secure) enabled. All your credit card information are protected by means of industry- leading encryption standards. izzudrecoba.com accepts all Malaysian Visa and MasterCard debit cards using SenangPay, where subject to bank availability. All debit card numbers shall be protected by means of industry-leading encryption standards. i. By choosing this payment method, the Buyer shall transfer the payment for the Goods to a izzudrecoba.com’s account for the total amount of the Buyer’s purchase (including any applicable taxes, fees and shipping costs). The transaction must be payable in Ringgit Malaysia. izzudrecoba.com, in its sole discretion, may refuse this payment option service to anyone or any user without notice for any reason at any time. ii. 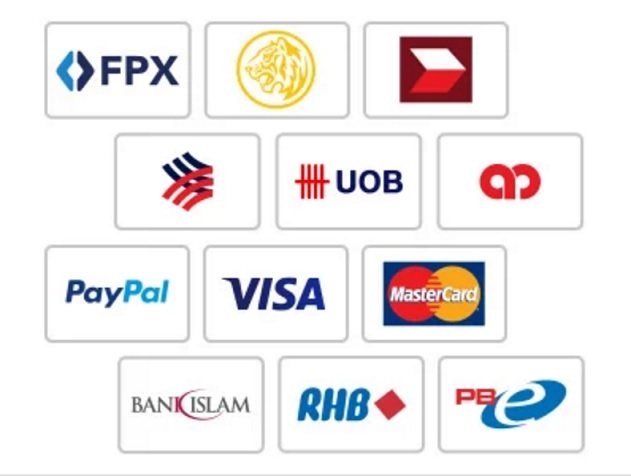 For the time being, izzudrecoba.com via Billplz payment gateway & SenangPay accepts online bank transfers from Maybank2u, CIMB Clicks, Bank Islam, RHB, Hong Leong Bank, Bank Muamalat, Public Bank, Alliance Bank, Affin Bank, AmBank, Bank Rakyat, UOB, Standard Chartered. 3.1 Delivery of the Goods shall be made to the address specified by the Buyer in its order. Streaming Video/Music/Sports Account: The account login (username and password) will be delivered to the Buyer’s email within 24 hours after payment. Streaming Device: 8-9 working days to arrive to your address from the warehouse in the U.S. via DHL courier (Free Shipping). Tracking number will be provided. MYIPTV Channel: The purchased channel will be activated on your android box within 1 hour after payment. MYIPTV – Android Box: 8-9 working days to arrive to your address. 3.2 izzudrecoba.com has the right at any time to sub-contract all or any of its obligations for the sale/delivery of the Goods to any other party as it may from time to time decide without giving notice of the same to the Buyer. 3.3 Any dates quoted for delivery of the Goods are approximate only. The time for delivery/performance shall not be of the essence, and izzudrecoba.com shall not be liable for any delay in delivery or performance howsoever caused. 3.4 If izzudrecoba.com has failed to deliver the Goods in accordance with the Contract or within a reasonable time, the Buyer shall be entitled, by serving written notice on izzudrecoba.com, to demand performance within a specified time thereafter, which shall be at least 14 days. If izzudrecoba.com fails to do so within the specified time, the Buyer shall be entitled to terminate the Contract in respect of the undelivered Goods and claim compensation for actual loss and expense sustained as a result of izzudrecoba.com’s non-performance, which was foreseeable at the time of conclusion of the Contract and resulting from the usual course of events. 4.1 Subject as expressly provided in these Conditions all other warranties conditions or terms, including those implied by statute or common law, are excluded to the fullest extent permitted by law. 4.2 Subject to this Condition, izzudrecoba.com warrants that the Goods will correspond with their specification at the time of delivery, and agrees to remedy any non-conformity therein for a period as below from the date on which the Goods are delivered or deemed to be delivered (“Warranty Period”). Where the Buyer is dealing as a consumer (within the meaning of the Sale of Goods Act and the Consumer Protection Act), izzudrecoba.com further gives to the Buyer such implied warranties as cannot be excluded by law. Roku: 3 months standard manufacturer warranty. NVIDIA Shield 4K TV / Pro / K-1: 1 year limited warranty. Amazon Fire TV / Amazon Fire TV stick : 1 year limited warranty. Apple TV: 1 year limited warranty. Slingbox M2: 1 year limited warranty. Android TV Box: 1 year limited warranty. If you’d like a copy of the manufacturer’s warranty for a product found on izzudrecoba.com, you can contact the manufacturer directly or visit their website for more information, or you can contact our Customer Service team by e-mailing us at: admin@izzudrecoba.com. If you choose to e-mail our Customer Service team, please include the full name of the product; the model or style, if applicable; and the URL (website address) for the product’s detail page. (a) No condition is made or to be implied nor is any warranty given or to be implied as to the life or wear of the Goods supplied or that they will be suitable for any particular purpose or use under any specific conditions, notwithstanding that such purpose or conditions may be known or made known to izzudrecoba.com. (c) izzudrecoba.com binds itself only to deliver Goods in accordance with the general description under which they were sold, whether or not any special or particular description shall have been given or shall be implied by law. Any such special or particular description shall be taken only as the expression of izzudrecoba.com’s opinion in that behalf. izzudrecoba.com does not give any warranty as to the quality state condition or fitness of the Goods. (d) izzudrecoba.com shall be under no liability for the following measures and actions taken by the Buyer or third parties and the consequences thereof: improper remedy of defects, alteration of the Goods without the prior agreement of izzudrecoba.com, addition and insertion of parts, in particular of spare parts which do not come from izzudrecoba.com. (e) izzudrecoba.com shall be under no liability in respect of any defect arising from unsuitable or improper use, defective installation or commissioning by the Buyer or third parties, fair wear and tear, wilful damage, negligence, abnormal working conditions, defective or negligent handling, improper maintenance, excessive load, unsuitable operating materials and replacement materials, poor work, unsuitable foundation, chemical, electro-technical/electronic or electric influences, failure to follow izzudrecoba.com’s instructions (whether oral or in writing) misuse or alteration or repair of the Goods without izzudrecoba.com’s approval. (f) izzudrecoba.com is not liable for any loss damage or liability of any kind suffered by any third party directly or indirectly caused by repairs or remedial work carried out without izzudrecoba.com’s prior written approval and the Buyer shall indemnify izzudrecoba.com against each loss liability and cost arising out of such claims. (g) izzudrecoba.com shall be under no liability under the above warranty (or any other warranty condition or guarantee) if the total price for the Goods has not been paid in cleared funds by the due date for payment. (h) izzudrecoba.com shall be under no liability whatsoever in respect of any defect in the Goods arising after the expiry of the Warranty Period. 4.4 Any claim by the Buyer which is based on any defect in the quality or condition of the Goods or their failure to correspond with specification shall be notified to izzudrecoba.com within seven days from the date of receipt of the Goods or (where the defect or failure was not apparent on reasonable inspection) within a reasonable time after discovery of the defect or failure. During use, the Goods shall be monitored constantly with regard to safety and defects. If there are even slight reservations concerning the suitability for use or the slightest reservations concerning safety, the Goods must not be used. izzudrecoba.com shall be given written notification immediately, specifying the reservations or the defect. However in no event shall the Buyer be entitled to reject the Goods on the basis of any defect or failure, except where the failure is such that the Goods delivered are of a fundamentally different nature than those which izzudrecoba.com had contracted to deliver. 4.5 If the Buyer does not give due notification to izzudrecoba.com, izzudrecoba.com shall have no liability for any defect or failure or for any consequences re-sulting therefrom. Where any valid claim in respect of any of the Goods which is based on any defect in the quality or condition of the Goods or their failure to meet a specification is notified to izzudrecoba.com in accordance with Condition 4.4, the non-conforming Goods (or part thereof) will be repaired or replaced free of charge as originally ordered. The information contained in this website is for general information purposes only. The information is provided by izzudrecoba.com and while we endeavour to keep the information up to date and correct, we make no representations or warranties of any kind, express or implied, about the completeness, accuracy, reliability, suitability or availability with respect to the website or the information, products, services, or related graphics contained on the website for any purpose. Through this website you are able to link to other websites which are not under the control of izzudrecoba.com. We have no control over the nature, content and availability of those sites. The inclusion of any links does not imply a recommendation or endorse the views expressed within them. Every effort is made to keep the website up and running smoothly. However, izzudrecoba.com takes no responsibility for, and will not be liable for, the website being temporarily unavailable due to technical issues or any other issues beyond our control. We are in no way affiliated or connected to Netflix, Hulu, DirectvNOW, HBO GO / HBO NOW, Roku, NVIDIA, Apple, Unblock-US, Starz, DirecTV, CBS, Showtime, Sony, Playstation, Matricom, Xiaomi, Kodi, Sky Stream, TP Link, Xbox, Amazon, Spotify, Sling, Slingbox, Comcast, ESPN, NBC Sports, BeIN Sports, Fubo TV, Sky Go, Hidemyass, WWE, UFC, Crunchyroll, NBA, NFL, or NHL websites. This website and its content is copyright of izzudrecoba.com– © Izzudrecoba Enterprise 2017. All rights reserved. All other trademarks not owned by izzudrecoba.com that appear in any izzudrecoba.com service, product or website are the property of their respective owners, who may or may not be affiliated with, connected to, or sponsored by izzudrecoba.com. All content included in or made available through any izzudrecoba.com service, such as text, graphics, logos, button icons, images, audio clips, digital downloads, and data compilations is the property of izzudrecoba.com or its content suppliers and protected by Malaysian copyright laws. The compilation of all content included in or made available through any izzudrecoba.com service is the exclusive property of Izzudrecoba Enterprise and protected by Malaysian copyright laws. You can visit our website, izzudrecoba.com and browse without having to provide your personal details. During your visit to our website, you may remain anonymous and at no time would we be able to identify you unless you have registered an account (“izzudrecoba account”) with us on our website and have logged on with your user name and password. izzudrecoba.com does not sell, share or trade customer’s personal information collected online with third parties. For example, payments that you make through our website will be processed by our appointed payment gateway. Disclosure to these data processing agents such as that of our appointed payment gateway in this context is necessary for the purpose of conducting the sales transaction that you have opted for. Our payment gateway, billplz, uses 128-bit SSL (Secure Sockets Layer) encryption technology when processing your financial details. 128-bit SSL encryption is approximated to take at least one trillion years to break, and is the industry standard. We will not share your information with any other organisations other than our corporate group and those third parties directly related to and necessary for the purchase of products, delivery of the same and purpose for which you have authorised. In exceptional circumstances, izzudrecoba.com may be required to disclose personal information, such as when there are grounds to believe that the disclosure is necessary to prevent a threat to life or health, or required by the law. izzudrecoba.com is committed to complying with the Personal Data Protection Act 2010,in particular, its policies as well as corresponding guidelines and orders. If you believe that your privacy has been breached by izzudrecoba.com please contact Customer Service: admin@izzudrecoba.com and we will resolve the issue.